G; unfortunately we are talking past each other; we are misunderstanding each other. I am just observing and measuring, not changing any parameters (or suggesting to change parameters, or asking for "help" to change parameters, or even tuning anything at this point.) You do know your stuff... I will buy you a beer when I see you and when I am stumped I will send you a PM. 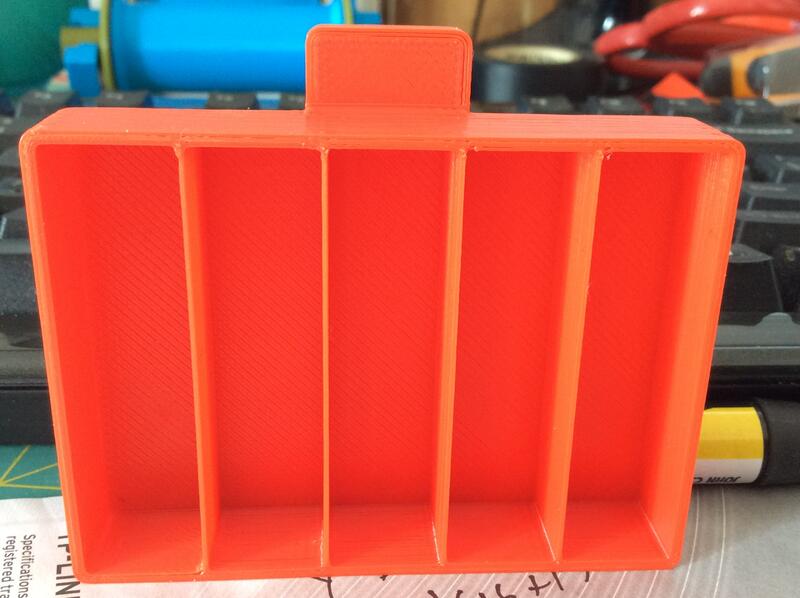 Here is the first Cura Print - a box for resistors. btw those draw dividers are thin @.7mm and have .03+/-mm variance. On the outside shell of the box, and using an inherited outside Mitutoyo micrometer, I am +/-4.5 thou variance or about a +/-.1143 mm. on the cheap digital vernier caliper I am seeing +/-.09mm variance on the outside of the box. There is one spot which is a small outlier. Being inherited, and more of a keepsake, and in thousands I never used my dad's old micrometer. The surprise here is that a <$20 instrument is measuring up to a precision instrument of old. https://www.amazon.com/Neiko-01407A-Electronic-Digital-Caliper/dp/B000GSLKIW?psc=1&SubscriptionId=AKIAILSHYYTFIVPWUY6Q&tag=duckduckgo-d-20&linkCode=xm2&camp=2025&creative=165953&creativeASIN=B000GSLKIW. The downside is that the battery holder of the Neiko always slips off. The first layer is smooth! Some words of advice for potential builders (slow down) and don't be quick to change parameters (get the mechanics working 100% first) way before you look to software. 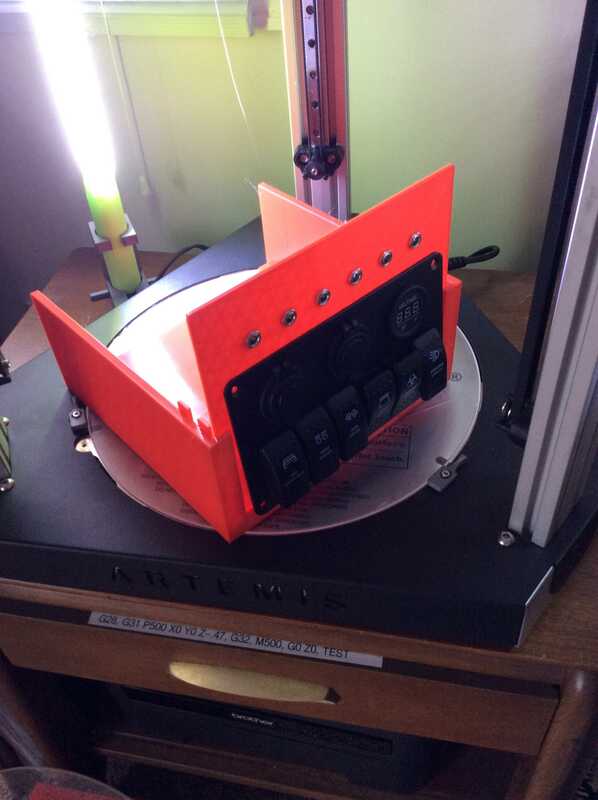 I printed some bolts to hold the top enclosure lid of the Artemis into place. The threads are perfect. 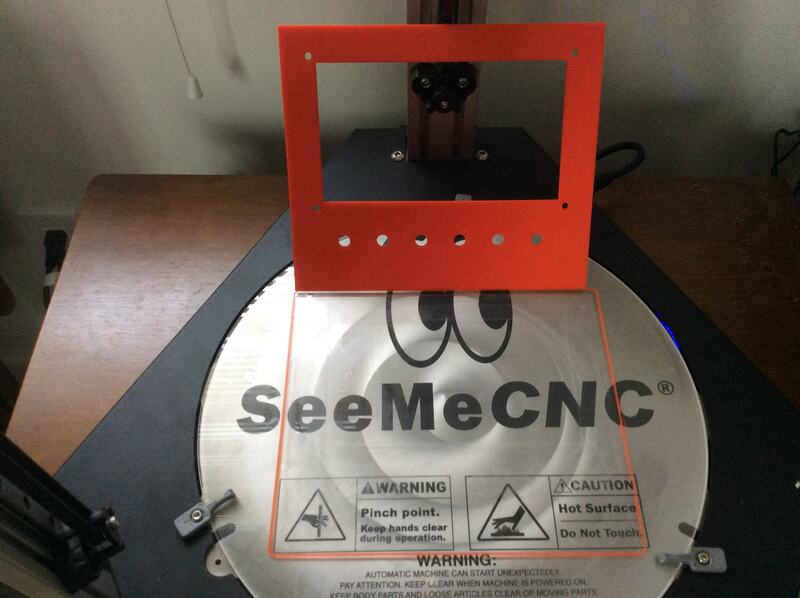 to seemecnc - the bed hold down clips could be just a tad less wide. You might be happy with the openscad parameters provided or you might want to tune them a bit. The cover is on firm enough for me. Perhaps, the "thread step" parameter could be a bit smaller and the "non thread length" could be a bit smaller. It looks like glue-stick on the bed is a thing of the past. For later reference, I did not realize that lexan sheets are relatively cheap. The question is how do you enclose the printer. I reduced Extrusion Factor to 85 as well. I found the print speed setting in Cura profile easily. I could not find the Duet equivalent of extrusion factor in Cura. You want the "flow" setting under the "Material" tab. Here is the first big print.. which covers much of the bed. It's a 12v power center for my desk.. for lights USB etc. A question was asked to whether or not auto leveling should be done on cool settings or hot. Having tried both, I would say cool bed and hot extruder. Or medium heat on the bed and hot extruder. Also you have to make sure there so not bits of filament on the end of the extruder. PS the "zombie light switch" is for lighting up my sig-other; which seems to happen whenever I buy/build a new 3d printer. I just finished up the machines first long print (more parts for the same project), a 23 hour print! This large part came out perfectly in terms of finish. The part was firmly attached to the bed, and when the bed cooled it released easily. I will upload a picture, I will refine the design a bit and then cut the printing time in half with a lower resolution. I had enough confidence (in the ecosystem - big picture) to do a long print w/o building up to it by doing some smaller test prints first. Again, the part came out flawlessly. What I am noticing with Cura vs Simplify 3d is that Cura has a wider range of tuning parameters; IMHO (I could be wrong here) S3d has better support structures, it seems to manage travel of infill better, and the interface is slicker and more intuitive. There is a big advantage to having access to tweaking and tuning. 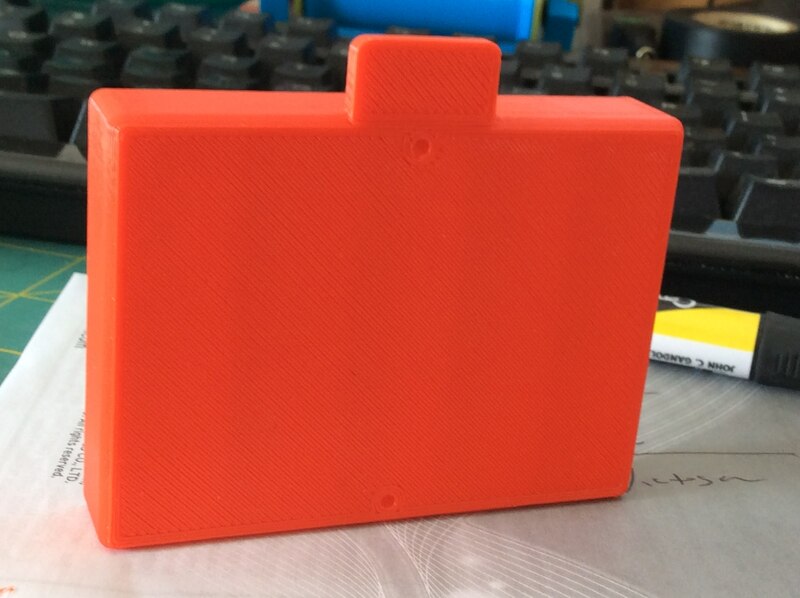 Anyway here is the project box I am building which was printed with a Cura profile. 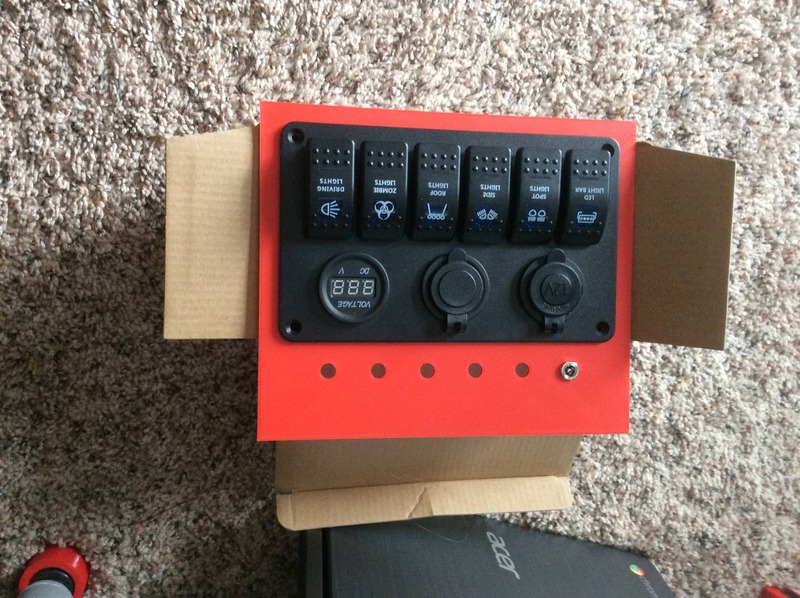 The power box will control lighting and charge USB.. I am going to mount the lighting on homemade "drafting table lights." I don't know if I am going to use the 3d printer power supply, a 10amp brick, or mount a power supply in the project box. You need to make sure you've got z-lift during retract set. The nozzle will quit striking the part during travel moves. You can set your z-hop to 4mm and the Z travel speed to 500mm/sec. It works great. In simplify3d I have z-hop set to a very low level and I don't have the issue. Could it be an issue (in the cura profile) where the "prior retraction" is leaving a zit behind, so nozzle goes vertical down at the same point it pings? That's how it "feels" when you run your finger over a print layer just before the next shell layer is about to lay down. Is it a question of pulling back more filament, or pulling up the nozzle? How long is the Bowden tube on the Artemis? When printing PLA I generally reckon on needing a retraction distance of a little under 1% of the length of the Bowden tube plus 1mm. Less if you are using a significant amount of pressure advance and/or Capricorn tubing. I use 0.25mm of Z hop. You can play around with retraction settings during a print if you use firmware retraction. To do this in S3D, check "Include M101/M102/M103 commands" and use M207 to configure retraction. That is a great idea, I never tuned within a print job via Gcode. "Omega" shaped inside cable clip holder for the Artemis..
That's a nice little omega cable clip you've got there. However, I don't recall any Artemis cables that need taming. Am I missing something? Yep no cables to tame. There is a beefy power supply - in the Artemis just waiting to be tapped; you are not heating the bed, so there is no bed-wattage-amperage running through the power supply say (guess) spare 14amps @12v I am (going to) running(run) external peripherals. I am using a spare +/- on the power supply and snaking cables outside (and behind) the printer to run lights @12v, 9v power for a linksys router, and perhaps USB power or an ipad or an android tablet - this way I can use the camera and screen with one device) Having the lights offset from the printer, pointing down, being movable, and then diffused is advantageous. I did not want to run power through an extrusion and out the bottom, nor did I want to add something permanent to the machine without it being planed out. did I mentioned in the build notes that external power ports would be nice. 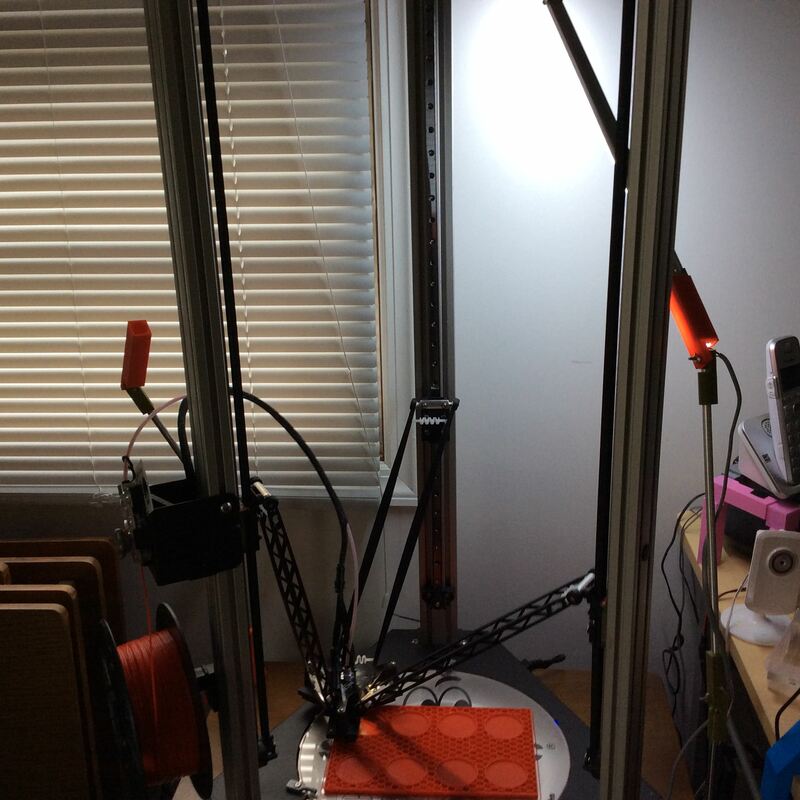 Basically I printed two copies of a drafting light I am using that clamps onto any desk; i should put the drafting lamp design on thingiverse. Also a longer Omega clamp can have a mounting point for heavy things. The clamp was designed by importing the extrusion profile into Fusion 360. SMD 5630 DC12DC in 500mm Aluminium channel - cool white @ $2 a piece. I have a question about your Cura settings. 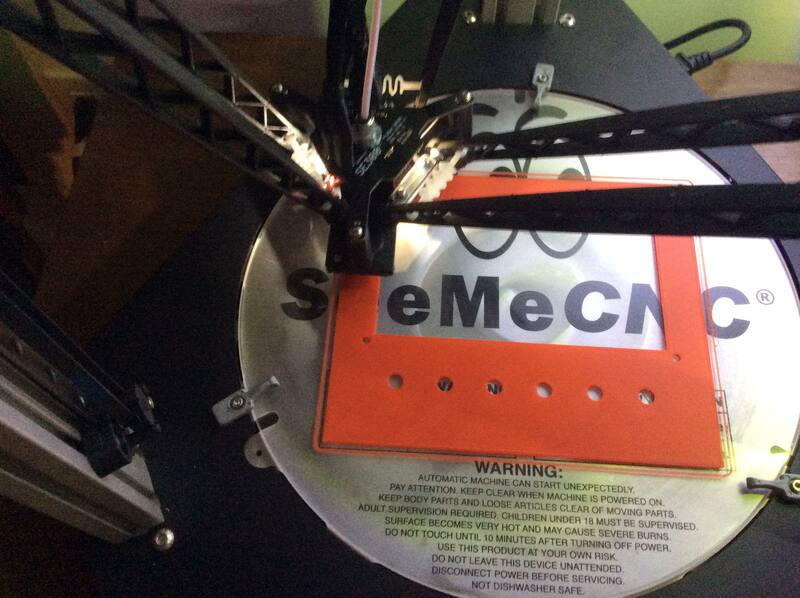 Did you have it set to Repetier and you changed it to RepRap, as per the image in the instructions in the SeeMeCNC guides? Or did you change it to Repetier from some other setting, and that's what solved your problem? Thanks for chiming in on my thread - I thought it'd be better to ask here since my question is specific to your build experience. I read this book about a year ago, it was great. Powder Coat as an insulator. I just got an email with a service bulletin. During my build I did check grounding because I was concerned that the powder coat would act as an insulator. My meter suggested that I was getting enough connection from the power supply box (which is also ground) to the frame. On my own builds I did ground the power supply directly to the frame. IMHO the service bulletin is a good idea..
(on another note; I don't think I will be getting the E3d tool changer; I like the idea but the build platform is not big enough for me.).. OK, so I ran mine "naked" for a while, i.e. without top and bottom covers. 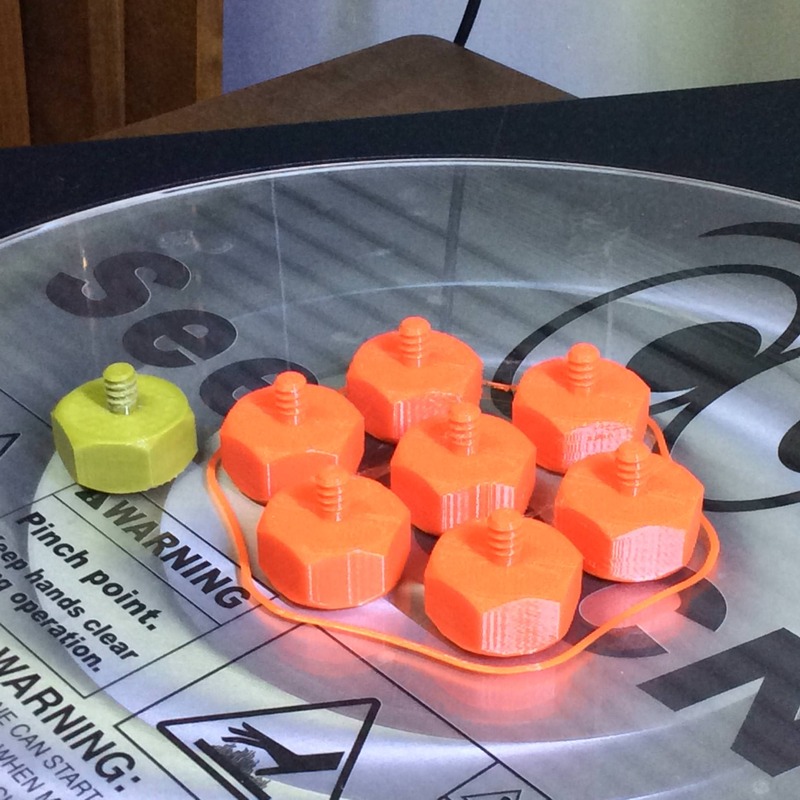 I got a few test prints done, including a set of the "nuts" for holding the top cover on instead of the plastic rivets. Those were hard to insert because the "holes didn't agree with each other". Ahh, the (lack of) precision of sheet metal parts. Here is where the problem seems to creep in. The top assembly sheet metal "platform" is folded up and at some point fitted around the top assembly frame, or the frame is built within the sheet metal, although I doubt that. The folds may not be perfect 90 degree folds and/or the folds may retain some "memory" and tend to spring out. I found that I could loosen the two long bolts holding the sheet metal to the frame between each tower pair (6 bolts in total), flip the top cover over to use as a gauge and press the tops of the sheet metal "corners" together to get the correct spacing - then tighten the bolts, flip the cover the right way up (connect the fan) and the holes agreed with each other. There was enough clearance between the bolts and the holes in the folded up sheet metal to allow me to bring them in, i.e. I didn't need to elongate any holes to make them line up, I just worked within the tolerance around the bolts.